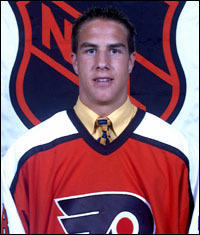 Was ranked 15th on the CSS Mid-Term report, his final ranking is 17th ... selected 10th overall in the 1996 QMJHL draft ... won a Gold Medal with Team Canada at the Under-18 Three Nations Cup in the Czech Republic ... was coached by Montreal Canadiens' Alain Vigneault in Beauport... was named Beauport's Rookie of the Year for 1997... admires the style of Anaheim's Paul Kariya ... participated in the 1998 Top Prospects Game where he place 2nd in the agility with the puck drill... was sidelined mid-season with a broken finger...Tied Mario Lemieux's record for most goals (4) in one game by a Canadian player in the World Junior Hockey Championship ... Top goalscorer in 1999 WJHC where Team Canada won the silver medal. An effortless, shifty skater with good acceleration and a quick change of pace ... a smart player who is very clever with the puck ... he is an unselfish player who effectively creates opportunities for his teammates ... he is creative with the puck and possesses natural scoring instincts ... he is always around the puck and is excellent in one-on-one situations ... is used in all game situations ... he is a good checker, although he is not considered a physical player ... he positions himself for transition of play ... a good competitor with strong desire and an excellent attitude towards the game. Says if he weren't a hockey player, he'd probably be a phys. ed teacher...Dad, Pierre, is a policeman and mom, Nicole, is an administrator ... Has a younger brother, Jean-François...lists golf as his fave sport other than hockey...likes the movies and Chinese food...fave NHL team: PHILADELPHIA...in juniors, people called him "kid"....in the Flyers they call him "Gags"...on the road, he rooms with Eric Desjardins (Thank you radio-canada...more than I wanted to know)...best friend is Eric Chouinard, 1998 first round pick, 16th overall, of the Montreal Canadiens...Gagné says that him and Chouinard cannot really be compared because Chouinard "is more a ' shooter', a John LeClair" while he "plays more like Wayne Gretzky or Joe Sakic, without saying that I am as good as them."